The VisualStudio C# REPL – O2 Platform can be downloaded here. From the download link you get a Visual Studio Extension (.vsix file extension). The latest version of OWASP O2 Platform is available: Your feedback is appreciated! In this image you can see that the download link is : http://tiny.cc/O2Platform. One of our ideals is to build a strong platform that helps people and organizations to create secure applications, therefore we would like to hear from you. We would like to know what do you think about it, do you think we could provide more documentation and examples about the usage of O2? . Let us know about it and we’ll be happy to receive your feedback. 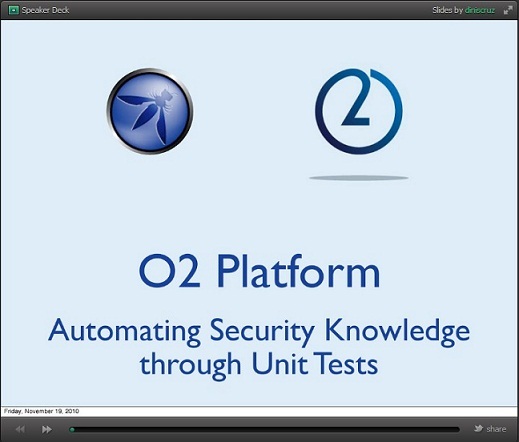 OWASP O2 Platform Presentation : A good starting point. If you didn’t realize there is a OWASP O2 presentation, I would like to provide the links with very helpful information. The title of this presentation is: OWASP O2 Platform – Automating Security Knowledge through Unit Tests , created by Dinis Cruz. I wanted to provide this information because I have seen positive comments from some of my colleagues in Costa Rica, after looking at the presentation, most of those folks saw the magic and power of O2 Platform. While we have seen the effect of static analysis at run time in the community, which was first described with a PoC using Microsoft’s static analysis tool CAT.NET and OWASP O2 Platform on top o Visual Studio .Net, we strongly believe on the value added of using O2 platform as a part of our development work. In this same way, a really nice to have feature would be an integration with FxCop . Namely, FxCop analyzes managed code and reports information about those assemblies. It analyzes several areas including : COM, Design, Globalization, Naming, Performance, Security and Usage. It would be great to have those security rules available on O2 Platform and why not via real-time analysis :). NuGet is a really interesting mechanism to install plugins on top of you Visual Studio project in a really straightforward way. Dinis Cruz made the first components of O2 Platform available in a NuGet package. Now NuGet presents a new paradigm to install useful tools and avoid all the complication of the XML configurations that usually is a pain. It’s really interesting to have all the OWASP O2 functionality available in this way. I bet this is going to be a better way to make it available in future releases or in the way we will publish features on top of Visual Studio .Net. In order to simplify our lives, this mechanism is a really good option :). There is a really interesting video that shows how to perform static analysis of code at the compilation time on top of Visual Studio.Net. The creation of this mechanism is really powerful , because at compilation time, you can find and correct most of the security holes we can create. Just imaging the valued added that this process can provide to a large software development projects?. And there is also a reddit thread if you want to get involved (I hope you are want). A new community has been created on Reddit for supporting Cat.Net , the static analysis engine created by Microsoft (but in the last year it has lack of support). We see an opportunity here to involve OWASP O2 platform and add value to our project in this new path of source code analysis. 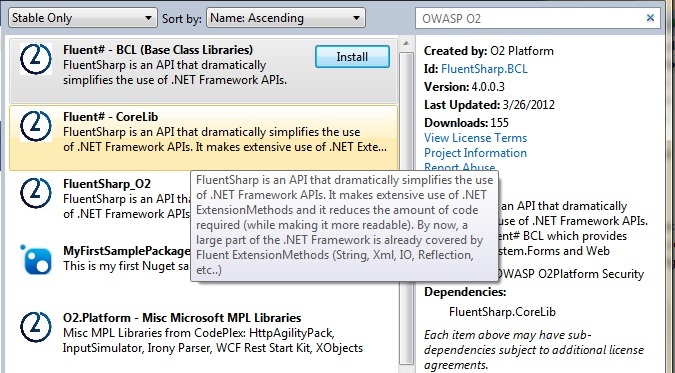 By the way, the Visual Studio add-in is located in your local copy of OWASP O2 Platform, in the O2.Platform.Projects folder there should be a Visual Studio Project named O2.VisualStudio.AddIn . The .AddIn file can be found in the binaries folder. Once you have installed the Add-in, you will be able to use this powerful tool on top of Visual Studio IDE. Not entirely sure what is the long term effects of this, but so far so good. In this post, I’m going to show the value added of using OWASP O2 Platform to exploit (and therefore correct/detect/prevent) vulnerabilities on top of Microsoft MVC platform. The industry has broadly adopting MVC architecture to build Web applications during the last years for several reasons, including the rapid and efficient paradigm it represents to build really good applications. Few weeks ago , a user exploited a vulnerability at GitHub . The vulnerability exploited in this case, represents an old issue in the MVC architecture of different frameworks including Rails. This vulnerability is often named mass assignment , but it is also known as over posting or autobinding. Dinis Cruz wrote an interesting post about this vulnerability in the Spring MVC framework in this post http://diniscruz.blogspot.com/2012/04/we-need-security-focused-saststatic.html. In this same line, Dinis wrote a really nice O2 script that allows to exploit this vulnerability on top of Microsoft MVC . In order to illustrate this use case of OWASP O2 platform, Dinis used a demo MVC application named MVC Music Store hosted in CodePlex( this is a great application that shows the use of this architecture). Dinis wrote the following script below to exploit this vulnerability, basically it is an IE automation script very powerful to overposting some post form fields and update them. Let’s see the script and then a quick explanation about it. 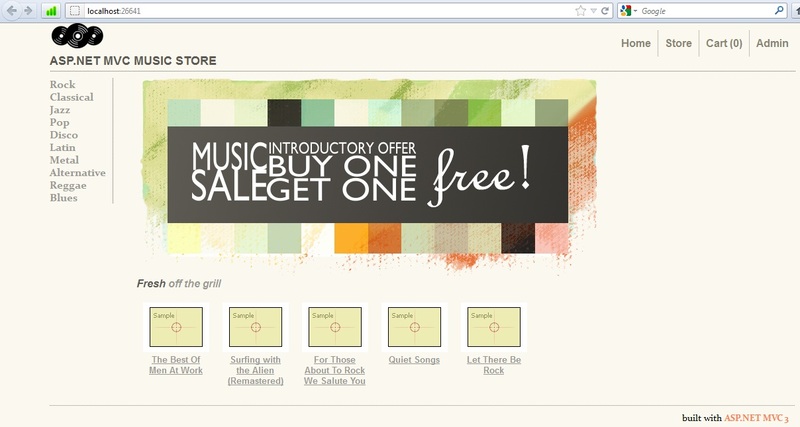 If you look at this script, you will notice that it purpose is to register a user, select an album and submit the order, but look that the script injects other fields (related to other album), so we are buying just one album but we are also submitting a second one by injecting it as a part of the HTML form fields, and guess what? it is for free :). If you look at the Orders model, you will notice that this model has some properties and the last one is a list of OrderDetails and lf you look carefully, then you will see that this property is not protected against modifications (like using ReadOnly attributes) . That makes possible that we could send some other fields as a part of the request. //Some properties of the Orders model. The Checkout controller accepts a FormCollection as a parameter and it holds all the HTTP POST form fields, from the below image you can see that it has the data for the second order. This script is one of the many examples of the advantage of using O2 scripts, we were able to exploit a vulnerability on top of Microsoft MVC. The script is quite simple and easy to read, apart from that, it is powerful enough to identify this kind of problems. The IE automation section in OWASP O2 Platform represents a new paradigm in the automation process and it power allow us to make Web Application Security visible. As you can see, it is easy to fall in this vulnerability, probably you can argue that this kind of issue might be solved using good design and best practices and you probably are right, but we are vulnerable when somebody could forget all the mechanisms to write secure code, specially when working with this kind of architecture. I would like to thank to Dinis Cruz for making this script available and all his work in the O2 Platform project.